Hello there! This week is off to a splendid start as Wow Embossing Powder and Pretty Pink Posh have put something lovely together! Keep reading or at least scrolling all the way down as the best might be saved for the last! We are going to bring you a fun hop where there are prizes from both companies up for grabs, inspiration and videos! So put the kettle on, make a lovely cuppa or drink for yourself and start hopping along the way. We have a super talented line up ahead as you can see. Here's the awesome designers taking part in the hop. If you get lost along the way, head back over to the WOW! Embossing Powder blog or Pretty Pink Posh blog for the complete listings of designers joining in the hop. The crafters involved in this hop are going to bring you an array of projects, colouring inspiration and a variety of ways to have fun with both Pretty Pink Posh and Wow Embossing Powders collectively. I made a fun little layout for the hop as I wanted to show how perfectly Pretty Pink Posh stamps fit also for scrapbooking! 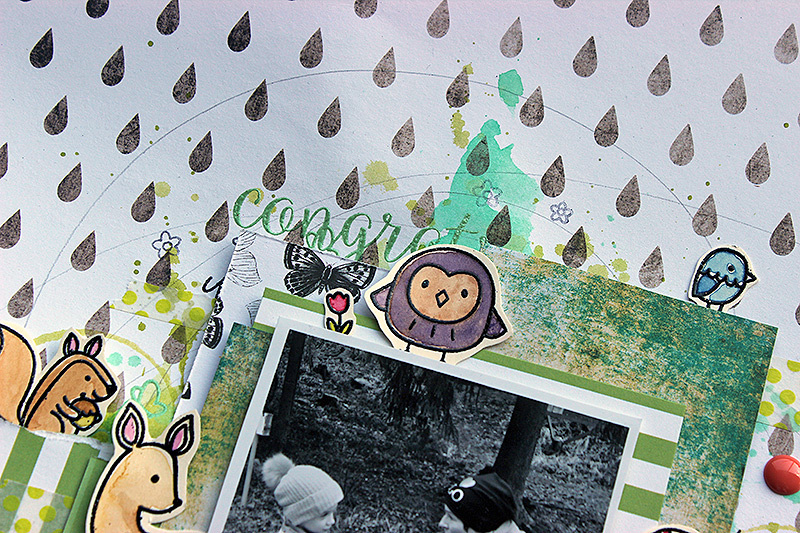 I used mainly characters from the "Woodland Critters" stamp set but added some from the "Happy Owls" stamp set as well. I stamped the critters using Wow embossing ink and then embossed them using black embossing powder. I colored the animals using watercolors which I added to the background as well. The woodland creatures fitted well to the topic of the page. The layout is about orienteering - a hobby my father is enthusiastic about and both myself and my girls have also tried it. The layout is about the love of nature as well and the picture it has is actually from a cross country run. Both of my daughters participated and they did so well! We went the route through together and then they run all by them selves. I guess they didn't see any animals during that spurt, though. The picture was taken when my older daughter was interviewed after the race. Thank you for hopping by today! Please feel most welcomed to browse my blog more to see what other kinds of crafts I do or come back tomorrow as I will then share another creation, this time a card, using Wow Embossing Powders and Pretty Pink Posh stamps! But something still, that you have been waiting for, right? The icing of the cake! No blog hop is complete without some prizes. Are you ready for some awesome giveaways? Each company is giving away a prize! Wow! Embossing Powder is offering any six powders from your choosing along with a Wow carry case to store you powders safely in. Pretty Pink Posh has put together a Prize Pack, an assortment of goodies up to the value of $75. The only think you need to do for a chance to win is leave a comment on each of the design team members blogs along the hop! So start hopping and being inspired! The winners will be chosen at random from the comments left on all the posts of this blog hop by 6.00am PST on Sunday 29th of July 2018 and will be announced on the Wow Embossing Powder blog on Monday 30th July 2018. This is an adorable layout! Love your woodland characters... some of my favorites from PPP. Very clever, scrapbookers will love it! Tosi symppis leiska! Inspiroi käyttämään rohkeasti erilaisia leimoja. So adorable! Love these critters! What a fabulously fun layout this is! I had never heard of it. Kudos to your girls!! Although I am not a scrapbooker, I love your layout! This layout is so nicely done! 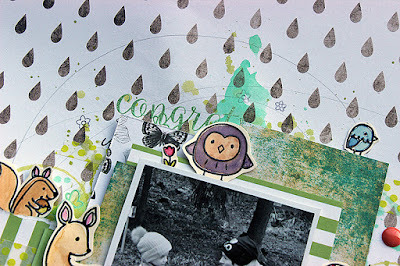 I am not a scrapbooker, but I can see how easy it would be to incorporate stamps and embossing into a layout. Love the layout. And the wonderful use of the theme. Nice inspiration! Such a cute picture for this adorable layout! Your Greengage EP made for the perfect backdrop of that photo...so natural. This is so cute! :) Great job! What a lovely scrapbook page. Beautiful design and your images so perfectly coordinate with your photo - enhances it perfectly. Ever so sweet and pretty. Such a delightful layout! Love your layering! Great layout! AWWWW those critters are just soooo precious! And the layout is so fun to look at! Adorable layout! Love the woodland critters! Very sweet. 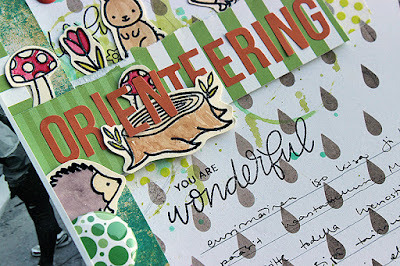 What a fun scrapbook page, you have really captured the substance of Orienteering with all the cute stamps and die cuts. This is a fantastic layout. I have never heard of Orienteering before. After googling it, found out it is pretty popular in my city. The spread is perfect for this. Oh my! It's truly adorable!!! Love your layout!!! Brilliant layout! These PPP critters are perfect for this project! Very beautiful layout. I love the cute critters scattered around! Fun layout, the black pops for animal details like the eye! What a sweet outdoor page. I just love all the animals on your layout. This is such a fun layout! The little animals look so adorable and it fits so well with the photo! Amazing! Adorable layout! Love all the sweet critters! SUCH A GREAT PAGE! I Love the detail and the layout! bags! A pretty layout! Scrapbooking has come a long way! Such a pretty layout. Love all the critters! Love the stamps... and I love seeing them on a page! Love your layout with all those fabulous little critters! Loving all the inspiration on this blog hop! Wow.. I love seeing how well the embossing powder performed on these detail images! Great design and thanks for doing a page layout! 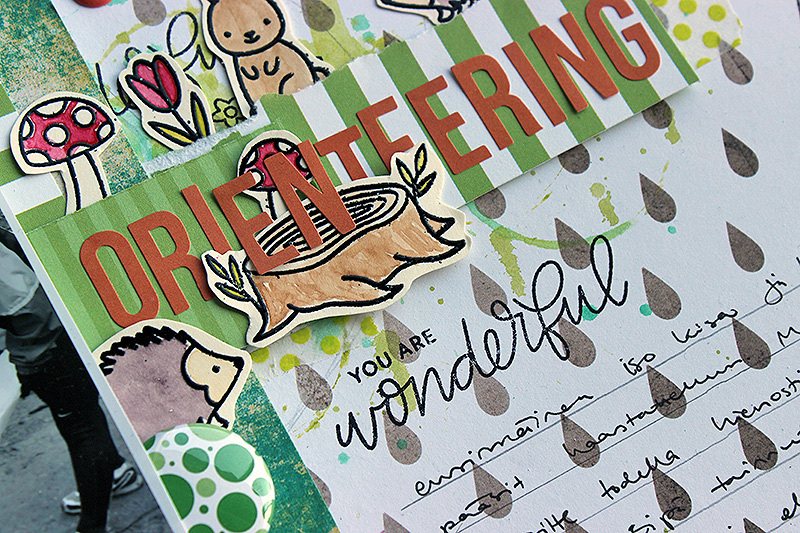 Very sweet layout and great use of the embossing powder to do watercolouring. Such a cute layout! I love all the critters! I like heat embossing around stamped images because it gives them such a clean, defined edge. This is a really sweet page featuring your daughter! Super cute!!. I have not scrap booked in awhile....I think I will again. Thank you for inspiring!!. Oh my gosh, this is so precious!!! LOVE the PPP critters and how adorable but seeing them on your beautiful layout made it even more so!!! Love it! 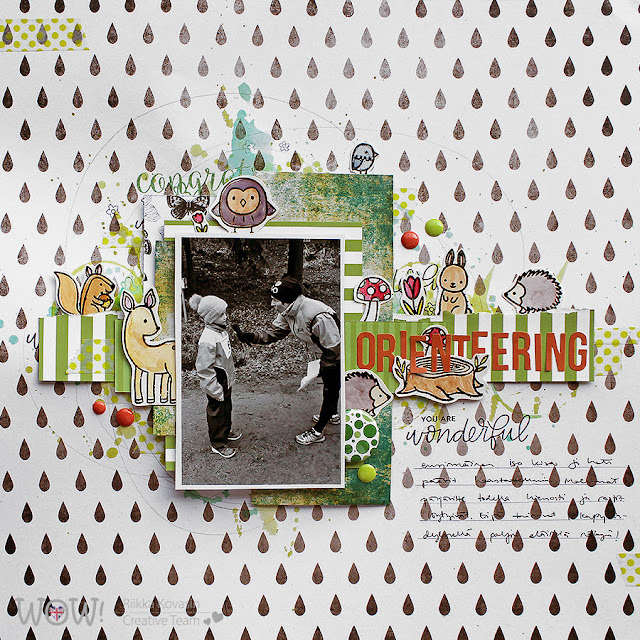 I love how you incorporated stamping in your layout, so sweet, and it fits in so seamlessly! Fantastic layout, I'm just getting back into layouts using stamps, this is such a great colourful, fun layout, it all blends so well as if a set to begin with. Gorgeous layering of elements on this fab page. Thanks for sharing your creativity. I love your layout ! It’s fun and so cute with all these sweet critters !! Great layout. Love the cute critters.